RUBBER FOOT incl. Bolt & Nut. 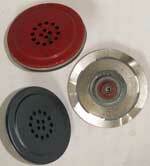 and black bakelite & brass plug.